Turned the key to leave Lowes this evening and things were bad. Limped it to a better area to check things out, pulled the valve cover and sure enough this time it is intake #1. This head has been reworked twice now (only guides were changed the first time), the second time was just about this time 3 years/40,000 miles ago with new seats, guides, valves ect as that time I lost exhaust #3. No indications of overheating. Shoddy work, just my luck or just its time ? Other than hardware salvage I am thinking this cylinder head has had its run and will become a test subject for porting practice. 355,000 miles at the time of failure. My plan forward is to use the cylinder head from the CSX's engine so I took that off this evening. It already had a roller camshaft installed, no idea what of course so I am wondering if I should swap them from the original head ? or just change the sprocket to round tooth and roll on with it ? A basic garage level refresh is all I am seeing here. There are no machine shops in the area I trust anymore to not screw up and take forever. I'd probably swap the cam from the original head. I think the timing changes like 4* when swapping between round and square. A turbo cam isn't going to run great in a N/A car. Just looked and advance can get a replacement sealed power for less than $100, going to just make it new. If that cam is the one I put in the CSX when I owned it, it was a square tooth, 88 cam. I’m positive I didn’t use a round tooth cam in it. Did you also do the studs ? I'm going to guess Frank did not change anything so whatever you installed is probably what it still is. Advance had a stock sealed power replacement cam for $90 so I ordered one.. along with about a hundred other things to do a quick n dirty head refresh. Still debating if I should pull pistons and do a ball hone, rings and rod bearings.. ? other than the failed cylinder from 3 years ago everything else has almost 100k on it now. Just before the overhaul 100k miles ago I did the 2.4 lifters and new rocker arms, the lobe on intake #1 had some flaking damage but I let it go, the damage has not gotten any worse but other than manifolds and the t-stat housing I want to have the second head as ready to go as possible assuming its not junk. I'm at work typing this and shopping for stuff but I should know this evening. If you're looking for a place for a head job, I'd suggest Precision in Hyatsville. My buddy uses them for head jobs for work, I've used them, and also a few friends. I have not had any real problems with them. It's one of the few places I've seen where I haven't heard anything bad of them. 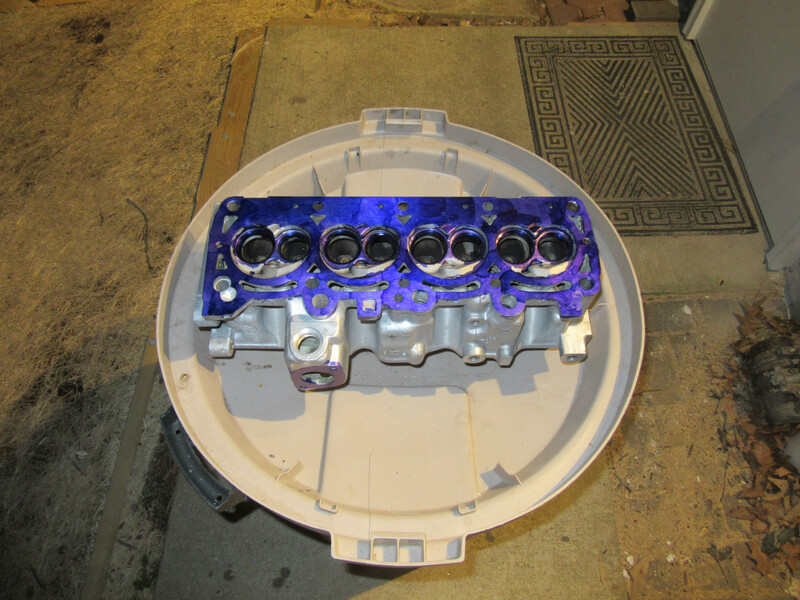 I had a really nice Tyler VanLant ported head that I couldn't keep rockers in. I tried everything. Several cams, replaced the valves and guides twice, new stock lifters, new PT lifters, a few sets of rockers. Nothing worked. It kept spitting out random rockers after hard pulls, and sometimes just randomly under light load. Turned out the head was warped -- majorly. Tyler had it decked, but I don't know if whatever shop he used checked to see if the head wasn't "twisted". The third time I took it to a new machine shop and the guy threw a straight edge on the rear valve cover gasket rail. Basically the whole head was twisted. The deck surface was flat, but the rest of the head was all out of whack. The cam was out of alignment, the lifter bores weren't round, yadda yadda. So now I've got a very nice flowing 782 paperweight in my garage. There's really no good way to straighten the thing back out at this point. I replaced it with another head that I had checked and double checked before I started. Lesson learned I guess. A heavy coating of gasket spray would probably be enough to save it as is.. so burned out from trusting any machine shop to actually do the job right and not take forever. The last two I will never use again. Three different places on the way into work sell granite countertops, I'll try them tomorrow to see if I can buy an end drop and lap it in myself. Got a piece of granite today and ordered a roll of 320 grit sand paper to get here tomorrow. Fumble on mcmaster, shipping from Chicago not NJ so no arrival until monday. went to work and drilled/tapped the oil gallery holes for pipe plugs. Not ideal but plan b came about to get the head surfaced. I glued 4 sheets of wet/dry down and started working it around. 320 and then 400 grit. Got rid of all the pitting, the dent from the dowel pin and the deep scratch by the oil feed inlet. I want to get some more 400 grit tomorrow and work it a bit more to make it 100% perfect, it is 95% there now. Checking with a non precision straight edge it is flat to less than .002 deviation across the deck. Last edited by 135sohc; 03-23-2019 at 11:07 PM. Reason: pictures! ive done that before (sanding head) but i used a sheet of glass and glued sandpaper to it. i strapped the head face up on a table saw and set the glass on top with a 2.2 deckplate onto to smoosh the glass flat. 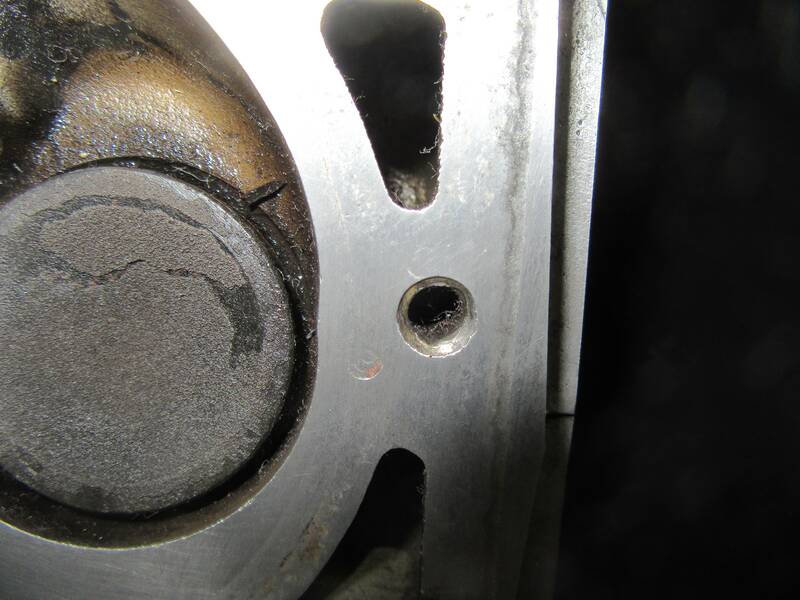 it was a subaru head that had fire ring pitting from galvanic corrosion. i sanded that all out, cleaned the head and its still on the car years later. added extra grounds to the head as thats what subaru did to stop the corrosion in later years. That surface looks great. Out of curiosity, what did the chunk of granite cost you? Do you know how flat they get those for counter top purposes? There's a guy on ARFCOM trying to grind some stone to a millionth of an inch or some such, but he can't get the temperature control in his place constant enough to do so. That's his theory anyway. ETA: What was the problem with this head originally? Did it drop a guide, or seat? 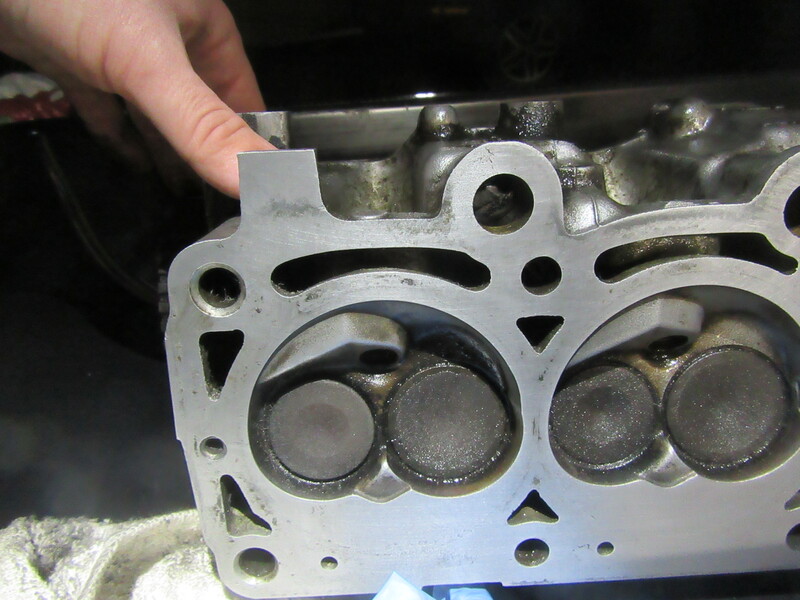 Man I feel for you guys that can't find a reputable shop that can successfully resurface a cylinder head. I guess I feel fortunate that I have a number of shops that can do it right every time. 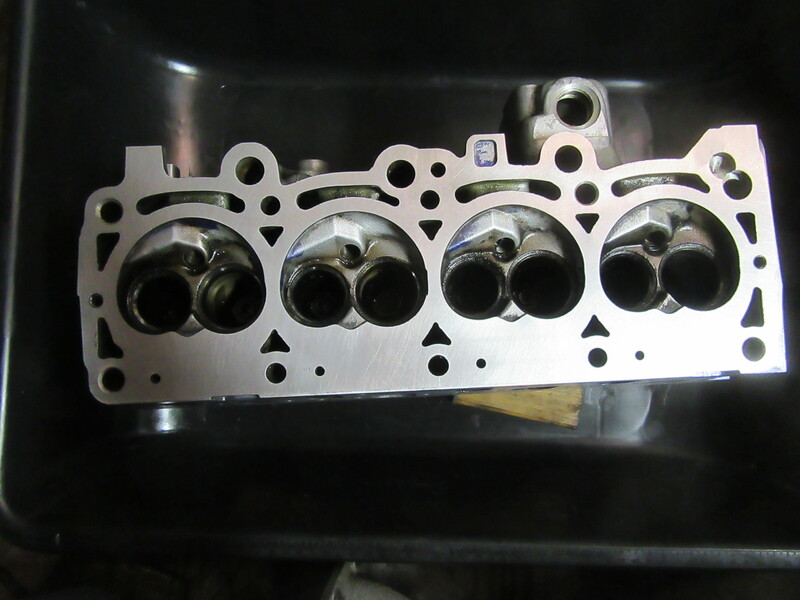 I DID have trouble finding a shop locally that could alignbore and hone cam journals on OHC cylinder heads. Exactly one in Twin Cities metro area that I am aware of. Flatness in metrology has many grades and temperature control is a huge factor. Surface plates have to be calibrated and used at a very set temperature if your seeking accuracy into the millionths of a inch. This head came off the CSX engine, it looks ok but the deck surface was rough. The head in the car has dropped a seat once and was reworked completely 3 years and I am 99.998% it has dropped another one. Thanks for all of that information. I have a nice straight edge which I could use to check any piece of granite I might come across. I'll potentially do so soon. I have a customer who does granite counter tops, so this may be an affordable deal. I looked at a head in my basment today which has been sitting down there forever. I think it would be the perfect candidate for this procedure. I really appreciate you taking the time to update this thread in such a complete manner. Cleaned up and re-blued for valve lapping and one more session on the granite with 600 grit. Rockauto has screwed me again. ordered 4 valves, they come packaged two per box and one box only had one in it.. Not expecting a fast turn around on that. reinstall the oe valves, break out the set of nos oem valves or try to get another valve asap from advance or autozone ? What are you bluing it with? ive used a sharpie in a pinch lol. Yeah at work I normally use a big sharpie, easier to clean off. Rockauto shipped the missing valve, I still think I'll use the NOS valves to keep things moving and shelve these for the next build. Somewhere I have a new old stock swirl head casting just waiting for something to come along. By Shelbydaytona91 in forum "I need help!"